At $2.29 per gallon on New Year’s Day, 2017 kicked off with a $0.29 hike over New Year’s Day 2016. And much ado was made when, just last week the national average reached the highest it’s been since June 2016, at $2.37. Regardless of the recent upward trend, we are still paying significantly less than just three years ago, when on New Year’s Day 2014 it was at $3.29. And remarkably less than in June 2008, when gas prices soared over $4.00 per gallon, hitting an all-time high of $4.11 that year in July. 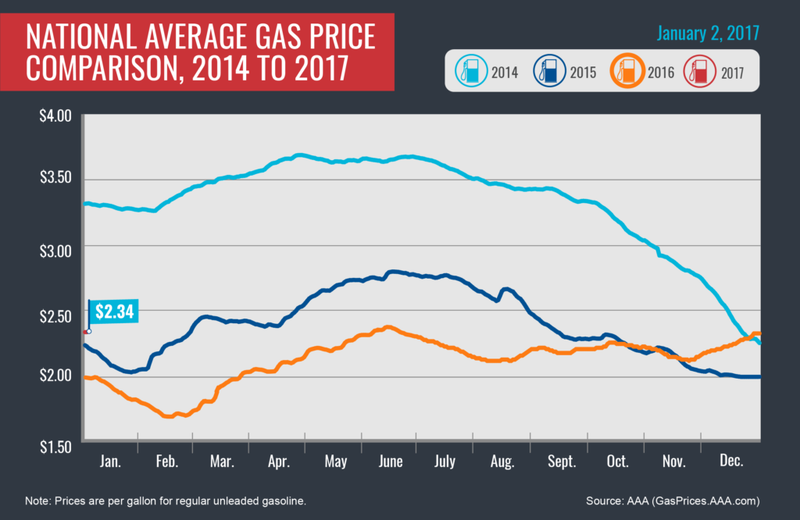 Check out this chart published by AAA earlier this month, comparing 2014 prices to today. So, what do the steadily increasing prices mean? Are we on track to hit more record highs? How will this impact our economy? According to estimations recently released by the U.S. Energy Information Administration (EIA), the first to release expectations that include 2018, the future looks bright — with a 2018 estimated average of $2.41, just under the 2015 average of $2.43. Exactly how future gas prices will impact the economy is tough to say. I don’t have an economy background, nor do I have a crystal ball, so I would be remiss to even guess. While the raw numbers may not be overwhelmingly convincing, they represent as much as a 25 percent increase in fuel efficiency in the last six years. If, over the next six years, these same vehicles were to achieve another 25 percent gain, the average highway mpg of these four vehicles will be 36.6 – a staggering difference from the 2008 average of 23.8. Is this enough to reach the CAFE requirement of 54.5 mpg by 2025? Good question and not one I can answer. The EIA estimates gas prices will increase about 12 percent from 2016 to 2018. If the fuel efficiency of the 2016 vehicles above were to increase at the same rate (an average of 32.8 mpg), we would be getting an average of 9 mpg better than we were in the same or similar 2008 models. In 2008 the average gas price was 35.6 percent MORE ($3.27 per gallon) than we’re expected to pay next year. So, overall, we’ll be paying less for gas while achieving better fuel economy?